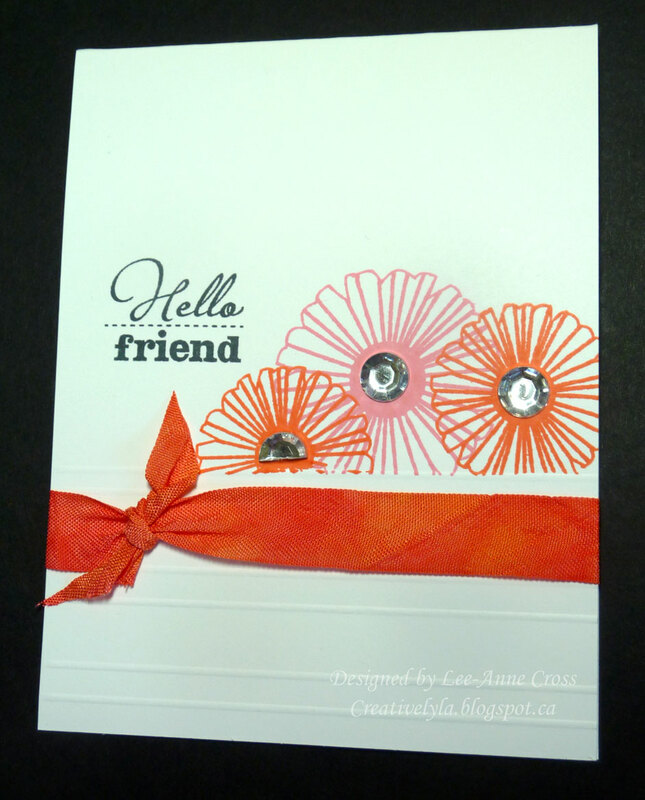 A quick and easy card today my blog friends. This is for some of the Dare to Get Dirty Challenges over at Splitcoast. I simply used my Scor-Pal to dry emboss some lines at the bottom of the card. Then I stamped two sizes of the flower in two different colors and used two full and one half rhinestones for the centers. How did I get half a rhinestone you ask? Just used my heavy duty scissors. But beware of flying half rhinestones! Don’t say I didn’t warn you! The seam binding has been hand-dyed and simply knotted. A quick stamp of the sentiment and done! If you haven’t tried hand-dying your own seam binding try it. I use a craft sheet…add a few swipes of the ink pad…spritz it with a little water and then scrunch up my seam binding, soaking up all the ink and water. A word of caution…this is messy! I keep a supply of medical examination gloves around for messy jobs like this…unless you like orange hands??? LOL! I place the comment for this card on the one above. Now want to say how I love the honeycombed background and great layers in background with black and yellows! beautifully done! So clean looking!! Such a fabulous CAS card! Love it!